Three outstanding female engineers have been recognised by the Institution of Engineering and Technology (IET) for their professional achievements and the work they do encouraging other young people into engineering. 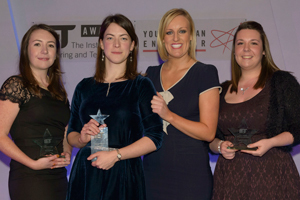 28-year-old senior hardware engineer Naomi Mitchison from Selex-ES has been named the IET Young Woman Engineer of the Year, and will play an ambassadorial role for the profession in the forthcoming months. 20-year-old Jessica Bestwick, who works for Rolls Royce, was presented with the IET’s Mary George Prize for Apprentices, and 27-year-old Lucy Ackland who works for Renishaw PLC in Stone, Staffordshire won the Women’s Engineering Society (WES) Award. Recognising outstanding female engineers has never been so important after recent statistics from the IET’s Skills and Demand in Industry survey showed that women represent only 6% of the engineering workforce. Further IET research showed that only 1% of parents of girls were likely to encourage their daughters into engineering, compared to 11% for parents of boys. Michelle Richmond, IET Director of Membership, said: “The lack of women in engineering is a very significant problem, contributing to skills shortages which damage the economy. The shocking reality is that the UK is missing out on half of its potential engineering and technology workforce by failing to attract women into the industry. It also means that women are losing out on interesting and rewarding career opportunities.